Perhaps because certain large species of cockroaches are known to inhabit sewers, we think of roaches as the ultimate germy creature. Their love of garbage and damp, smelly places like outdoor restrooms and mucky leaf litter doesn't help their reputation. A roach's constant grooming removes a large number of these germs, but its feces and other secretions leave germs in its wake. Approximately 4,000 species of cockroach inhabit the earth, with 70 found in the United States. Two of the most common include the large sewer-dwelling American cockroach and the smaller, garbage loving German cockroach. Cockroaches are able to transport at least 33 types of bacteria, 6 types of parasites and other pathogens, leaving them behind in their oily secretions and feces. Although the World Health Organization does not consider roaches to be a major disease vector as a roach's territory is very small, the droppings and oils they leave in their wake may contain enough bacteria to cause diarrhea and vomiting and spread local outbreaks of cholera, typhoid fever and plague. As the roaches crawl through sewage, garbage and other decaying matter, organic material containing bacteria cling to the stiff hairs on their legs. Cockroaches constantly groom themselves, eliminating much of the bacteria. In an experiment conducted by the University of Technology in Sydney, both cockroaches and human hands were passed over a dirty surface and left for two hours before being swabbed. After overnight incubation, the swabs taken from human hands produced significantly more bacteria than those taken from the cockroach. While germs are a valid concern, cockroaches endanger the health of more people through their saliva, feces and other excretions, which trigger allergies and asthma in sensitive individuals. While a certain amount of bug parts are acceptable in processed foods in the United States, they comprise a main course in South America, China and other Asian countries. Frying roaches in hot oil kills germs that are clinging to their bodies and provides a crunchy crust that contrasts with the bug's creamy center. Don't let anyone tell you it tastes like chicken, as its earthy flavor is reported to be somewhat salty with a hint of ammonia. 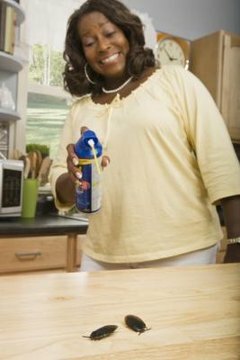 When fully cooked to kill germs, roaches provide as much as 35 percent protein, a high concentration of iron and little fat. Cockroaches have traditionally been used in Chinese medicine to treat ailments involving the heart, liver, spleen and joints. While at first glance this might seem counterintuitive, a 2013 study by the Second Hospital of Tangshan in China show that extract from Periplaneta americana -- the large American cockroach most often found in sewers -- improved the prognosis of patients with sepsis, a dangerous blood infection. The protective factors come from the roaches brain and nervous system, which contains chemicals that kill nearly 100 percent of bacteria, explaining why roaches can live in unhygienic conditions without getting sick. MSN Health and Wellbeing: Are Cockroaches as Dirty as We All Believe? Cure All Pest Control: Are Cockroaches Really Nutritionally Excellent?